One thing that became very evident in the Saints’ 20-14 Divisional Round Playoff win the other day over the visiting Philadelphia Eagles was how much of a direct impact that Saints fans themselves were able to make by yelling and screaming at the top of their lungs; and thereby making it difficult for Eagles QB Nick Foles to successfully operate his team’s offense. The Eagles drew several false start or delay of game penalties as a result; and it clearly was because the Eagles O-Linemen and receivers couldn’t hear the snap-count that Foles was attempting to yell out over the crowd. 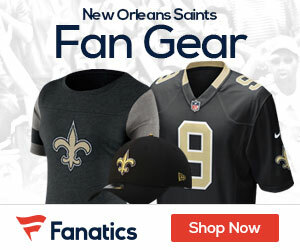 However, now that the Saints are set to face the Los Angeles Rams in this upcoming Sunday’s NFC Championship Game, the Saints might even have an even greater chance at using the crowd noise of the Superdome to their full advantage. Simply because Los Angeles operates their offense by utilizing a series of pre-snap check downs / audibles which often times are directly relayed by Rams head coach Sean McVay to QB Jared Goff, right up until the 15 second cut-off that’s imposed by NFL rules. And if McVay and Goff can’t communicate with each other as successfully as they normally can do, it certainly could create some issues for the them on this particular Sunday; with passionate Who Dats cheering on their team that is now just one more win away from going to Super Bowl LIII (53) in Atlanta. As noted by USA TODAY National NFL writer Steven Ruiz: Los Angeles often times will line up quickly at the line of scrimmage, leaving McVay just enough time to assess the defense and call an audible (if necessary) before the play clock hits the 15-second mark. That’s when the headset communication between the coach and quarterback cuts off. The Rams have been operating that way since McVay took over as head coach before the 2017 season, and it certainly will be the way they’ll be operating again this upcoming Sunday. However, the Rams reportedly have said that the noise of the Superdome didn’t bother them all that much when the two teams met previously at the Superdome two months ago; although it would be fair to say that Who Dats will be making even LOUDER noise this time around in what is obviously a much bigger game with a Super Bowl at stake. Several published reports after the win over Philadelphia suggested that the noise from the Superdome crowd was so intense that it might have even BROKEN the Superdome’s sound barrier. A meter that was in the press box at the Superdome reached 130 (the highest level possible) during the game. In his post-game press conference, Saints head coach Sean Payton verified the impact of the Superdome home crowd even further. The Saints have opened up as a 3 and half point favorite for Sunday’s big game, and McVay told reporters that he and the Rams intend to be ready for whatever obstacles might come their way ― and that includes 70,000 plus screaming Who Dats. “I think what you can really take away is you get a chance to play that opponent but you also get a chance to feel what a tough atmosphere that is to play in,” McVay said. McVay and the Rams won’t have much of a choice other than having a positive attitude, because it certainly will be an issue that they’ll be forced to deal with this Sunday. The New Orleans Saints — perhaps more so than ANY other NFL team — has mastered the art of utilizing crowd noise as an extra-added advantage. And you had better believe that the “weapon of sound” will be at their disposal once again, in Sunday’s NFC Championship Game….